The practice of gratitude as a tool for happiness has been in the mainstream for years. Long-term studies support gratitude’s effectiveness, suggesting that a positive, appreciative attitude contributes to greater success in work, greater health, peak performance in sports and business, a higher sense of well-being, and a faster rate of recovery from injury and from injustice. Gratitude and well-being has been on my mind these last few days. 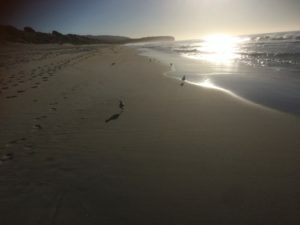 Recently, as I came over the sand dunes at the beach, the sun glistening on the sea was momentarily blinding and I was struck with an expansive sense of gratitude. Gratitude for living in such a beautiful place, for the sun, for all I have in my life…. I enjoyed the sudden zing and pulse of energy that gratitude brought me in that moment. But while we may acknowledge gratitude’s many benefits, it can be difficult to sustain. So many of us are trained to notice what is broken, undone or lacking in our lives. And for gratitude to meet its full healing potential in our lives, it needs to become more than just a word. We have to learn a new way of looking at things – a new habit. When I was going through some truly challenging times – a divorce, a change of country, teenagers spinning off into teenager-hood – I relied on writing in my gratitude journal every night. I was struggling to keep things going personally, professionally, as a mum, and moving from the semi-tropics to the deep south of Aotearoa/NZ had me frozen me to the bone for months. I needed the physical act of writing about what I was grateful for every day. Sometimes all I could think of writing was ‘the sun came up’, – and when I wrote just that, it lifted my spirits and brought peace and calm into my body, mind and spirit. It was truly a physical connection with a mindful practice. It is when I am truly challenged that I witness how powerful the practice of gratitude truly is. Don’t get me wrong: gratitude isn’t a blindly optimistic approach in which the bad things in life are whitewashed or ignored. Pain and injustice exist in this world, but when we are able consciously to focus on the gifts of life, we gain a feeling of well-being. Gratitude balances us and gives us hope. It is a matter of where we put our focus and attention. As you practice, an inner shift begins to occur, and you may be delighted to discover how content and hopeful you are feeling. That sense of fulfillment is gratitude at work.